Summer camps are an institution in the United States. Generation after generation of the same family can go to the same summer camp, and it's not unheard of for people's professional networks to include fellow campers from a particular summer camp. For young people around the world, American summer camps also offer ideal summer jobs. From lifeguards to teachers to nurses to camp counsellors, each American summer camp employs a large staff to ensure that its campers are well supervised, provided with a wide range of activities, and, most of all, happy, healthy and safe. If you are considering teaching at an American summer camp, be sure to investigate the type of camp that would best suit your skills, the location of the camp and the style of the camp. In America it can often seem like there is a type of summer camp to suit everyone. If you would like to become a member of a summer camp staff, think about your own particular skills. What are you interested in? What are you qualified to teach or supervise? Translate these answers into a specific type of summer camp. From general outdoor camps to music camps to sports camps to language camps to educational camps to non profit camps to camps for disadvantaged youth, there is a type of camp out there that will be a perfect fit for your skill set. The United States is a large country and one that has several different distinct geographical zones. For some gap year travellers the location of the camp is important because of its proximity to home. For these gappers the location is simple: East Coast of America is closer to home and therefore a shorter flight while West Coast of America is father from home and therefore a longer flight. The middle of America, often called the Mid-West or the "heartland" is somewhere in between. However, different locations also mean different weather and different proximities to oceans or lakes, mountains and hills, and therefore different activities at camp. 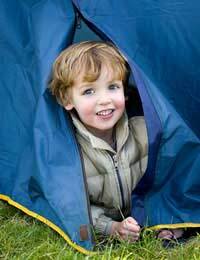 Summer camps in the States are usually divided into two styles: day camps and sleep-away camps. Day camps only operate during the day, so campers go home to their own families in the evening. At these camps, international staff members often live together off-site or are housed with a host family. Sleep-away camps are those in which both the campers and the staff members live at camp for a designated period of time. At these camps, staff members either all sleep together in a bunk or dorm, or they are dispersed throughout the campers' bunks or dorms in order to act as supervisors at all times. However, summer camp styles may also be narrowed down slightly further. In addition to day camps and sleep-away camps, camps may also be religious or secular, catering for mainstream or special needs campers or part of a major organisations such as the Boy Scouts or Girl Scouts of America. Teaching at an American summer camp is a great way for a gap year traveller to journey abroad, hone his or her skills and make some money and memories at the same time. For more information on American summer camps, contact the American Camp Association (www.acacamps.org) to find out more.